Jack’s set of moulds includes three “rising boards” and two “moulds.” The three rising boards owned by Jack are each two inches wide. 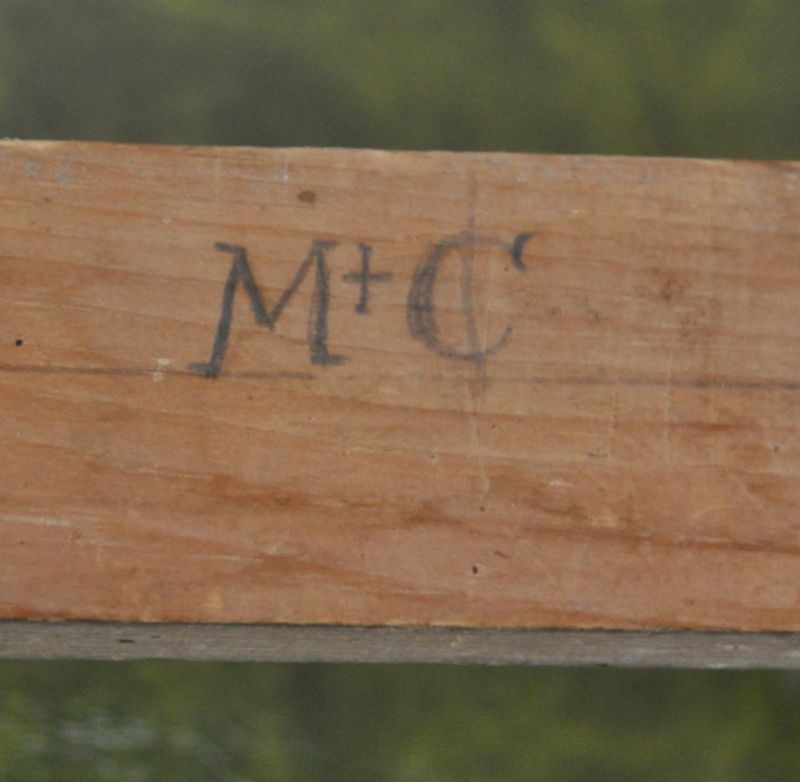 The rising board, also known as the rising square, corresponds to the keel of the boat and will have the same width. The two curved pieces that Jack refers to as the “moulds” correspond to the section of the hull from the [crop of the bulge] to the sheer. The two moulds in Jack’s set are identical with a radius of thirteen inches. These moulds are used to get the desired shape of timbers for a rodney or a punt. Each of the pieces is marked to indicate how they need to be aligned to get the desired sections of the boat. 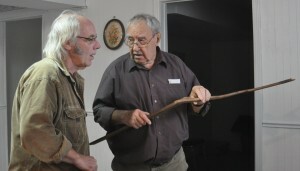 Although Jack is unsure about how many sticks were included in the original set owned by his grandfather, it was most likely a three-piece mould that included the rising board, the curved mould, and a third piece that is no longer found in this set. Read more about the three-piece mould method here. Jack starts by using a square to mark perpendicular lines. 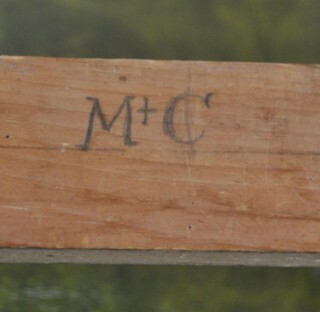 He then finds the mark on his rising board that corresponds to the midship bend and places the rising board perpendicular to the horizontal line at this mark. Next he finds the mark on his curved mould that corresponds to the midship bend and lines it up perpendicular to the top of the rising square. Finally he uses a straight edge to draw a line to get his angle of deadrise, adding hollow by eye. Once complete, he will have the shape for the midship timber. Despite using the same moulds that were used by his father and grandfather, Jack notes some significant differences in the way these moulds were used and the boats that were produced from them. Jack says that when his father’s generation built boats, they would use the moulds to shape each timber before assembling them onto the keel. According to Jack, this method resulted in a timber frame that was not fair, and would have to be planed to accommodate the planking. His grandfather’s boats also had the same outcome, often requiring shims to fit the planking tight against the timbers. When Jack began to build boats, he didn’t continue to use the moulds the same way his father had. 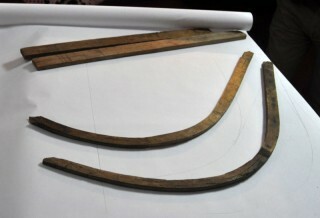 Instead of using the moulds to get the shape of each timber, Jack only used them to get the shape of his midship bend. To make the timber beds more symmetrical, Jack would use the moulds to get the shape of one timber and then used that timber to shape its matching pair for the other side. Jack’s father, Michael Casey, used these moulds to build boats that would have been a maximum of four feet across the midship and would have tumblehome. Jack preferred to build boats that were flammer and wider at the midship bend. He would use the moulds more as a guide to get the shape of his hull, making alterations to suit his own preferences. His last boat from these moulds was a sixteen foot row punt that he built for Wallace Skinner in Pasadena in 2009. At midship she is twenty-seven inches deep and sixty inches wide. Once Jack has the shape of his midship timbers he puts on his counter and runs a batten around to get the shape he wants. 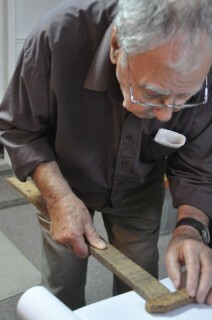 He then moulds out a rough forehook and afthook before completing the battens. Using a piece of lead, Jack would get the shapes of the remaining timbers. Placing the timbers approximately eight inches apart, Jack leaves them a slightly longer than he’ll need. He saws them down after putting on his clean strake, before completing the gunnels. He determines the sheer by eye, saying that if a boat is twenty-four inches deep in the centre, you would rise her seven inches at stem, and measure with a batten from the top of the counter, making adjustments until it looks right.